It’s officially summer! 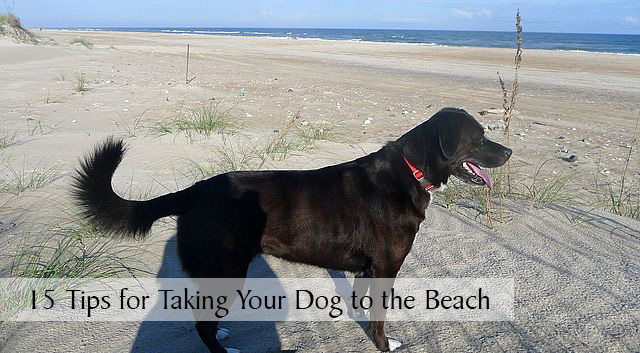 If you’ve got a beach vacation coming up soon, I’ve got some great tips to share with you for taking your dog to the beach. What could be better, right? Sun, sand, warm breezes, ocean waves and having your dog right beside you to enjoy it all. The beach is one of Haley’s favorite places, but there are a few things about the beach that aren’t quite so dog friendly. We learned a lot through trial and error during our beach vacations with Haley and a few crazy days spent on the remote, Portsmouth Island. Before you read the beach tips below, be sure to check out my earlier posts, Tips for a Holiday Road Trip with Your Dog for packing lists and general doggie travel advice and 10 Tips for Exercising Your Dog in the Summer for tips on keeping your pup safe in the summer heat and how to prevent and treat heatstroke. Okay, on to the beach tips! 1. Protect those paw pads. 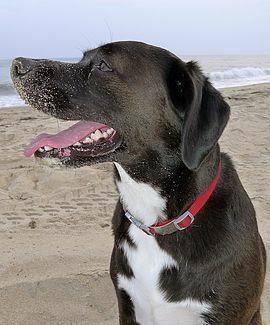 The sand on some beaches can get extremely hot and if you’re wearing flip-flops or beach sandals you might not realize just how uncomfortable it may be for your dog’s feet. Apply a product like Musher’s Secret to those paws before hiking out to the shoreline. 2. Find out if your dog likes to swim. If it’s your dog’s first time at the beach, start off in a quiet area with calm water to see how your dog reacts. Not all dogs can or like to swim; some just enjoy walking along the surf line, and that’s fine. Even dogs that are good swimmers can become overwhelmed by strong waves and currents, so keep a close eye on your dog at all times. Make sure you’re familiar with how to deal with rip currents and lateral currents. Occasionally we read stories about humans that drown while trying to save a dog caught in a rip current but the dog manages to make it back to shore, so it’s good to be aware of different types of tides. 3. Consider a life vest for your dog. Whether you’ll be boating or just playing in the surf, a life vest can be a great investment, for both fun and safety reasons. Even dogs that swim well can benefit from wearing a life vest because they can enjoy more time in the water before they get tired. A life vest with a handle on the back is convenient for lifting a dog out of the water. Humans and dogs alike need occasional breaks from the sun. A playful, energetic dog can become overheated quickly at the beach. Large shade umbrellas are nice, but if you’re spending hours on the beach you’ll really appreciate some type of shade tent that can provide enough area for a few people and your dog to cool off. Some shade tents even have wind breaks to protect from blowing sand. Trust me, it’s definitely worth the effort to lug it to the beach. 5. Don’t forget your dog’s sunscreen. You might not associate sunburns with dogs, but it can happen if your dog spends a lot of time in the sun. Sunscreens made for dogs, babies or sensitive skin are normally fine to use as long as they don’t contain zinc oxide, but check with your vet if you have any concerns about using sunscreen on your dog. Apply it to your dog’s nose and ears and also the belly and groin areas if they like to lay on their backs. Dogs with pink noses and skin, shaved dogs and dogs with light-colored coats especially need protection from the sun. 6. Pack plenty of water in the cooler. Dogs can get dehydrated easily at the beach so plenty of cool, fresh water is essential. It’s also worth packing a lightweight, collapsible bowl in your beach bag instead of having your dog drink from a water bottle. A good supply of fresh, cool water is also the best way to prevent your dog from drinking too much salt water which can be harmful. You’ll want to check local ordinances for off-leash and leash length rules, but long leashes can come in handy at the beach. They can give your dog more room to roam when needed and tied to a shorter length when required. I also take extra leashes that can be secured and left in different locations. For example, I always leave one tied to a cottage stilt at ground level for when we’re hosing things off outside or getting things in or out of the vehicles. It’s handy to have it ready to use if I need to secure Haley and keep her safe. On a related note, if you’re able to let your dog off-leash at the beach, always make sure she’s wearing a collar with ID. 8. Handling the beach poop. 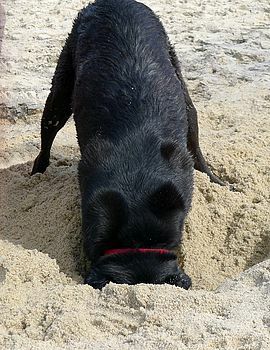 Nobody wants to dig up buried dog poop when building a sand castle, yuk! Take several poop bags with you every time you head out to the beach. It can be a long trip back to the cottage or car if you forget one and it can be quite embarrassing too. If you’re alone with your dog and have to leave to retrieve a bag, people will surely assume you’ve decided not to pick up after your dog. Be kind and help out a fellow dog owner if you ever see this happen to someone else, they will surely appreciate it! If you’ll be on the beach for hours, a heavy-duty, galloon-sized ziplock bag is nice to double seal any smelly poop bags if there are no trash cans around. I have seen some dogs that like to poop in the water at the beach. Yep, that’s a tough one to deal with but at least try to clean it up if you can. 9. Handling the sand-covered face. If you have a dog like Haley that likes to dive into the surf and dig for crabs in the sand, leave a bottle of water in the shade for rinsing off their face. You don’t want your dog trying to remove sand from their face or eyes with their sand-covered paws. I like to use a thin, microfiber hiking towel moistened with clean water to carefully wipe the sand away from the eyes and muzzle area. 10. Avoid hidden dangers in the water. You’re probably thinking sharks, right? You’ll want to avoid them too, but it’s not uncommon for dogs to cut their paws on sharp objects like shells under the water. I especially avoid areas around fishing piers where there’s likely to be hooks or cut fishing line in the water. Watch your dog carefully for limping or signs of injury. 11. Light up the night walk on the beach. What dog doesn’t like to chase crabs on the beach at night? It can get pretty dark out there at night, so I attach an led light to Haley’s collar and I take a laser pointer along with me. I rarely use laser pointers around Haley, but beach walks at night are one place where laser pointers can be useful if your dog likes chasing the light. The sound of the wind and ocean waves can make it tough for your dog to hear your call if they’re running off-leash and the laser pointer can be an easy way to direct them back to you. I’ve never had to actually use it for that purpose, but it’s good to have it if you need it. 12. Give your dog a clean rinse or bath. All that sand and salt can be really irritating to you dog’s skin. Rinse your dog off with clean water each time you come back from the beach, then follow up with a soothing, natural shampoo if your dog has sensitive skin. If you’re staying at a cottage, most have outdoor showers and hoses with warm water that are ideal for rinsing off your dog. If you can’t give your dog a bath, a soft brush can help remove some of the excess sand from their coat if you have a short-haired dog. 13. Protect those sensitive ears. If your dog is prone to ear infections, dry their ears thoroughly after swimming or bathing and consult with your vet about an ear rinse solution that can be used after swimming to help remove excess moisture in the ear and prevent infections. 14. Keeping sand out of your car. Don’t even bother trying, haha! Seriously, the sand will get pretty much everywhere and there’s no use stressing over it. You can keep excess sand and dirt at bay though by using large quilts or cargo covers in your vehicle to catch most of it. Shake them out occasionally and then throw them in the washer when you get home. For more tips, read 10 Tips for Keeping Your Car Clean. 15. Don’t forget the toys! Frisbees and toys that float are good choices for the beach. A lot of dogs love tennis balls, but they can get pretty sandy when wet and your dog may not like all that sand in her mouth. The best tip of all is to enjoy your vacation with your pup. Most dogs have a blast at the beach and some will run and play until they are completely exhausted. Between the sun, heat, waves and running in deep sand, make sure to take lots of rest breaks to just hang out, relax and maybe even take a nap together. Are you taking your dog to the beach this summer? Share your beach tricks, tips and hacks with us! We lived across the street from the beach in Germany on the North Sea. We were over there walking and playing at least once a day. It was great fun! We all miss it, but Mom doesn’t miss the mess I always was from the sand and salt water. I needed a bath almost every day. Katie didn’t go in the water except to get her legs and paws wet so she wasn’t a problem. The beach was awesome! Emma, I bet it was fantastic to live so close to the beach that you could visit everyday if you wanted. I hope you and Katie get to visit another one real soon! We spend a lot of time at the beach and your tips are right on. The only other one I’ve learned the hard way is to watch for those four paws all up in the air and be prepared to wash or use doggie wipes to clean-up after a good roll on something dead and stinky that washed up with the last high tide. Nothing quite like scent of eau de dead fish (or should it be poisson morte) to remind you of your day at the beach. Really great list of tips. I never thought about a laser pointer for a night walk at the beach. Clever. Even dogs who don’t swim often love the beach. What could be better than all that soft sand with stinking critters living just below the surface? I know the beach is dog heaven for Haley! I have a feeling that Honey will soon be a master swimmer and who knows, maybe she’ll even use that soft mouth to come up with a “catch of the day”! Thank you! Y’know what? My little dogs have never been to the beach! We used to take the big dogs to water all the time, but life has been crazy. We need to print this list and get them to water. Not sure how they’ll like it. There’s something special about a dog’s first time to the beach. You’ll have to take them soon and let us know how the little dogs like it. I bet they’ll have a blast! Lol! That must have really confused Cole the first time. Having a mouth full of sand sounds horrible, yuk! Great tips for a beach day. Doggy sunscreen is so important! Thanks, sunscreen is something a lot of people don’t think about with their dogs. Yeah, that’s a bad feeling when you realize you forgot or lost the leash. A few years ago, we met several family members at a Christmas tree farm and the leash I always kept in the truck was missing, yikes! I sure got a lot of strange looks walking my dog around with the thick tether strap which happened to be in the truck bed. People probably thought Haley was one vicious dog, haha! Looks like fun, but my Human only takes me to the beach in the winter when the sand is cool and the water cooler. The fall and winter can be great times to visit the beach! Yes, that salt water can really mess with the stomach of some dogs and accelerate dehydration. I’m sure Haley ingests some when she’s playing in the waves and fetching sticks from the water, but luckily she’s never had a problem with it. Don’t let them drink salt water(Mr. N did this once and learned his lesson). I normally make him wear something bright because otherwise I can’t see him because he is sand-colored. Also this year, we’re testing out a shirt that blocks UV rays. You’ll have to let us know how well the shirt works. Great advice about wearing something bright too! great post! sharing to my facebook page right now. Such great tips, I was at the lake this weekend and picked up my gangs poo but someone else didn’t, drives me nuts. That’s so aggravating! Whether it’s poop or trash left behind, it ruins the beach experience for everyone else. It’s not that hard to pick up after yourself and your dogs. This makes me wish we had a beach to take the dogs to! Wonderful tips to keep in mind in the event that we ever get that privilege. I hope you can go one day soon with Louie! We live about 10 hours from the beach, so we don’t get to go every year and it’s quite a drive to get there, but very much worth it. Thanks for stopping by today, Karen! Perfect timing, we are off to Big Bear Lake next week. Have a great time there next week with Jack and Maggie! Great tips! We don’t go to the beach as often as we used to. (Used to go 3X per week.) Oy, the sand… Even with the car seat covers and towels it ended up everywhere. Even though I’d rinse the dog when we got home, there’d be sand in the house as well. I must admit – I don’t miss all that sand! Once the weather starts to get really hot here again we’ll probably start going at least once a week again. 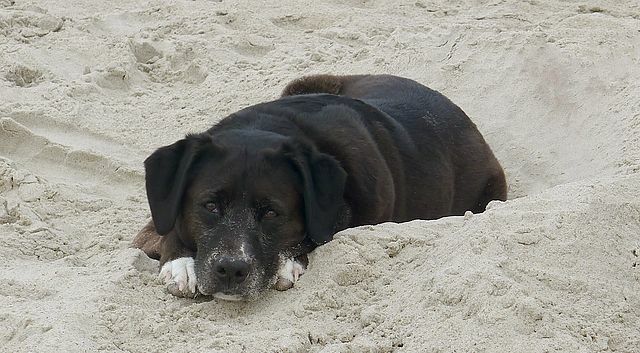 The sand is wonderful when you’re on the beach, but not so wonderful in your bed when the dog jumps up for a nap! I know what you mean, Jackie…no matter how well you think you’ve rinsed off the pups, there’s always some sand you find later in the house. Great posts – lots of helpful and handy tips! I love going to a nice quiet beach with Cody. Although I always try to go the day before he gets washed – the sand just doesn’t come out of his long fur! I can’t wait till winter’s over and we can enjoy summer! Quiet or remote beaches are the best! It’s nice when you can let dogs off-leash to run and play when nobody’s around. It’s easy to forget that it’s winter now where you live, but tell Cody to hang in there…summer will be there soon! I bet they all love digging in the sand! Not all dogs get into digging but it’s really fun to bury their toys and watch them uncover them. Enjoy the summer! I love these tips! When we took Sampson to the beach I was very worried about the currents and was careful to keep him closer to shore. It was a smart idea to keep Sampson close for his recent trip to NC. Rip currents happen quite a bit along the Outer Banks and some people even keep their dogs on a leash in the water. It’s interesting though that most dogs figure out how to get out of a riptide, but people tend to panic and swim against the current rather than parallel to the beach. Such great tips – so useful!! Being in land-locked Indiana, these guys have never had the opportunity to play on the beach (except Emmett, who got to during his road trip last summer), but it’s a dream of mine. It just looks so fun! Unfortunately it’s a long drive to the ocean from Ohio too. We went to northern Michigan a few years ago and Lake Michigan was gorgeous! I could have sworn I was at the ocean, the water was clean and blue and it was nice not having to deal with the saltwater. The sand dunes were beautiful too. It’s not too far of a drive and you seriously feel like you’ve been to the ocean! No one ever remembers #10 and it’s so important – thank you so much for the reminder. When I was young my dog got a fish hook stuck in his lip from nosing around on the beach floor. Luckily it didn’t pierce the skin too badly but it did get stuck and we felt terrible about it. Oh the poor guy, I’m glad it wasn’t too bad though and you were able to remove it. With all these shark bites happening lately in North Carolina around fishing piers, I wonder if some fishermen are chumming the waters and attracting sharks. I guess that’s one more reason to avoid swimming near the piers. Those are excellent tips. Always got to watch out for the hot sand and paws (mine and the dog’s lol). How exciting, Raegan! I just checked out your new blog and can’t wait to read more about the puppy adventures that lie ahead! I’m sure your new pup will love visiting the beach one day too. Ace is also prone to ear infections, and I’ve learned it’s a good idea, like you said, to rinse his ears out afterwards. I use an ear cleaner and then dry with cotton balls. Aw, I’m surprised that hasn’t happened to Haley before too, before we realized just how hot the sand can get and started using the paw wax. Some dogs have such a great time at the beach, it’s hard to recognize when they’ve had enough of the sun, heat and waves. Lucy loves the beach, and she seems to never tire out! She is one that chases fish, especially if there is a school swimming by. So, we tie a 150 ft rope to her collar and hold the other end so she can’t swim too far away too fast. Its also great because lots of kyacks are used in the area we go to, and Lucy is super friendly and thinks all passers by MUST want kisses, so she paddles fast and furiously to get to them! Oh my gosh, Lucy sounds like a true beach dog! I bet she would love going kayaking too. She could ride on the kayak, then jump off to play with the fish sometimes, lol! I would love to see a video of her water fun. ? I loved your tips. I also take those cooling vests for him not to be so hot…he’s a German spitz. Lol! Thanks, Deise! The cooling vest is a great idea, especially for dogs with all that fur. I appreciate you sharing that wonderful tip! ? How are you? I have read your whole article. It’s very informative. Every dog lover who likes to spend time with her dogs on the beach should read this post. Actually, Dogs are like to play on the beach. Some dogs are just crazy about it and when they reach the beach can not control themselves and start running and jumping. So we have to be more conscious about them. Especially when they got themselves into the water. Thanks for sharing your knowledge. I am taking Beano a Shihpoo to the beach Oct 1 for a week in Ocean City MD. This will be his first trip and the first time i have taken a dog to the beach. Thanks for all the tips and i can not wait for Oct 1 to get here. Very informative! Thank you for sharing it with us. Really liked the tips. I hope these will work with my doggos.